Here's How You Can Add Zing To The Boring Green Tea! Green Tea has certainly won many hearts with its incredible health benefits. Be it a man or a woman, a college goer or a retired person, everyone believes in the miracles of the green tea. But where did this green tea inspiration originally come from? According to legends, it was discovered by Shannong, the then Emperor of China. He did not go to search it, in fact, it is said that few green tea leaves fell into his cup of hot water, back in 2737 B.C. Since then the popularity of green tea has gradually spread all over the world. Green tea is scientifically known as Camellia sinensis. It is a nonfermented tea that is rich in antioxidants. Actually the green tea, black tea, and oolong tea, all come from the same plant. But when it comes to green teas, the main difference is in its picking style: the fresh green tea leaves are picked from the apex: the highest point of the stem, the point where the leaf ends. Also, the contributing factor for it being the winner is that it is processed in a way that prevents too much oxidation, thus making it antioxidant-rich. How Green Tea makes you healthy? It is a proven fact that more the fermentation of tea, more the caffeine, and less the polyphenols, which is the case with most of the other teas in the market. As green tea is least fermented, it has polyphenols that give it medicinal properties. Amongst all the above-mentioned catechins, the EGCG is the most potent one. It not only actively scavenges the harmful free oxygen radicals but also protects the DNA from damage. Did you also know that green tea can actually block the cancer signaling pathways? But having said all the merits of green tea, we still would refrain ourselves from having it. The reason: the boring taste. 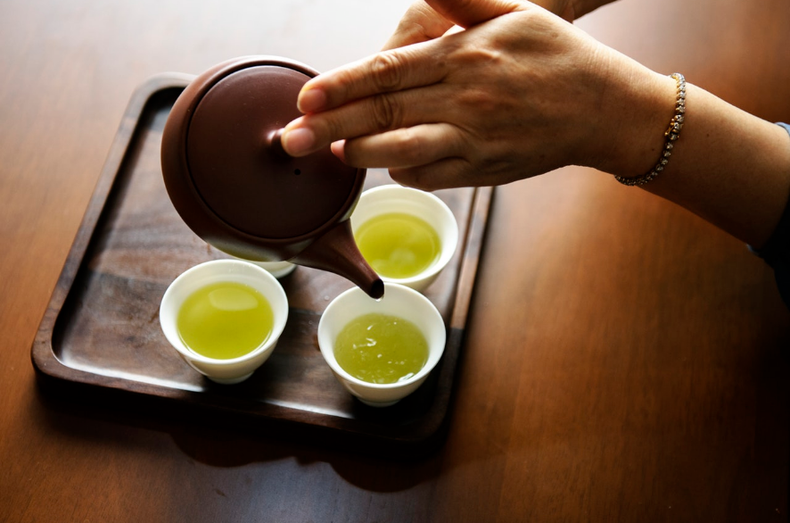 So in order to make the green tea more exciting, let us quickly learn a few ways to make Green Tea. How about preparing green tea with green tea powder? Green tea powder is something that you can find it in the market and use it. It gives a different taste to your tea, especially when added with any sweetener or honey. Take 1 cup of boiled water. Make sure you don't boil it too much. Let the water cool down for some seconds and then add 1 tbsp green tea powder. Once you see the color changes to brown, pour it through a strainer and add 1 tbsp of any sweetener or honey. Your Powder-wala Green tea is ready! Using green tea bags are easy but if you have ever tried having green tea leaves, I am sure you would know the difference. It is considered fresher and gives even more aromatic green tea. Take 1 cup of water, 1 tbsp of green leaves and boil it to 80-85 degree Celsius, not more than that. Otherwise, the tea may turn bitter. Turn off the heat and let the tea be untouched for 30-45 seconds. Now strain the tea and relish its different taste. Green tea itself has amazing benefits but when it is clubbed with cinnamon, the potion becomes a magical one. The advantages of cinnamon are dated back to 5000 years and have a direct connection to weight loss and other any benefits. Incorporating the cinnamon stick, of course, will give your green tea an additional taste. The easiest of all we must say! Simply add the green tea sachets and a small stick of cinnamon into a kettle and pour over 1 cup of hot water. Infuse for five minutes. Now remove the sachets and cinnamon stick. Let it cool until it is comfortable to drink. According to NDTV, Lemongrass green tea is called “the healing brew”. Adding lemongrass to your green tea will certainly make your monotonous cup of green tea refreshing and delightfully healthy. The best part is you can always grow lemongrass, a perennial plant, easily in your garden or indoors. Take 1 stalk lemongrass, 1 piece of ginger and 1 tbsp of honey in a cup. Then pour hot water followed by dipping the bags of green tea. Let it rest for some time and sip in your delicious cup of healthy tea. Ginger and Mint both have never let anyone down. Be it in the case of proper digestion, weight loss or relieving stress. Moreover, this combination contains high levels of Vitamin C, magnesium and other minerals. As we all know the ginger root is extremely beneficial for health, once added into tea, it can also soothe menstrual cramps. Take around 3-inch piece ginger. Unpeel it and then thinly slice it. Add the ginger, few fresh mint leaves (you may want to cut it for more flavor) and squeeze in fresh lemon juice in a cup. Now add one tbsp of honey and then pour in hot water. Once you have poured the hot water, dip the tea bag into the cup. Your citrusy green tea is ready to make you feel relaxed. It is recommended to have green tea post lunch or breakfast. Having green tea empty stomach is not advisable and neither is it recommended to have it at night. Never heat the water too much, the ideal temperature to brew the green tea is (75-85 degree Celsius). I hope you start taking green tea, actively and religiously. Do let us know if you have tried any of the ways mentioned above and how it has shown positive effects. Go green! No green tea se problem nhi hoti girls ko, only pregnant ladies ko nhi pina chahiye or jinhe weakness ho unhe b nhi. Mam, does green tea has any bad affect in our body ? Specially girls . Please tell . . Because one of my friend said me that girls ko green tea Nahi piina chahie bad me problems hota hai aesa hai kya Kuch ?? Thank you dear upsana, have you liked its effect? Pleasure is all mine @Bindu 😊 Are you drinking green tea?